Sparkline or Microchart is a tiny little chart that you can place on dashboards, reports or presentations to provide rich visualization without loosing much space. 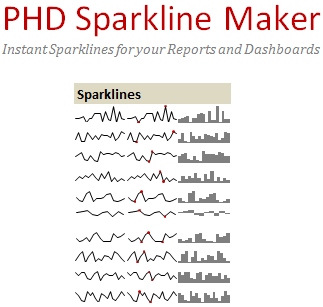 In excel 2010, MS introduced a beautiful feature for creating sparklines from data in spreadsheets. For earlier versions of Excel (that is 2007 and before) there is no native support for sparkline visualizations. Thankfully, there are several good add-ins and open source projects (Fabrice’s fantastic Sparklines for Excel is one) to create small charts in Excel 2007 and earlier. But almost all the ways of creating sparklines in Excel involve either installing an add-in or running a macro or violently formatting a regular line chart. While these methods work fine for a seasoned sparkline maker, what about you and me, who need a sparkline once in a while? That is why I created an Excel Sparkline Template. Using this template is as simple as eating a donut. You just enter the data and sparkline will be automatically generated. No macros, no add-ins. Just copy the sparkline(s) and paste them as images wherever you want. And you are good to go. How this sparkline template works? The file is capable of generating 10 sparklines, 10 sparklines with high, low points highlighted and 10 win-loss charts. Each sparkline can contain up to 40 data points. The charts are dynamic, so as you enter more data or remove data points, the chart gets adjusted automatically (related: Automatically change charts when source data grows / shrinks using OFFSET and Named Ranges). The charts are standard line charts and column charts re-sized to look like sparklines. All the formatting (like grid lines, labels, axis, title, backgrounds etc.) is removed and only the line / columns are retained. Do you like this sparkline chart template? I hope you like this sparkline template. Do tell me how you are planning to use this template. If you use a commercial or free add-in to get sparklines, share your experience using comments. This looks like it could be very useful for a project I'm putting together right now, thank you so much. Quick & silly question, how do I copy & paste the sparkline as a picture? Am I right in thinking that the y-axis is set automatically by excel? That makes it possible to get the column chart not to start at zero. "Chart Tools/Layout/Axes/Primary Vertical Axis/More Primary Vertical Axis Options"
thanks for the work creating the template!!! !